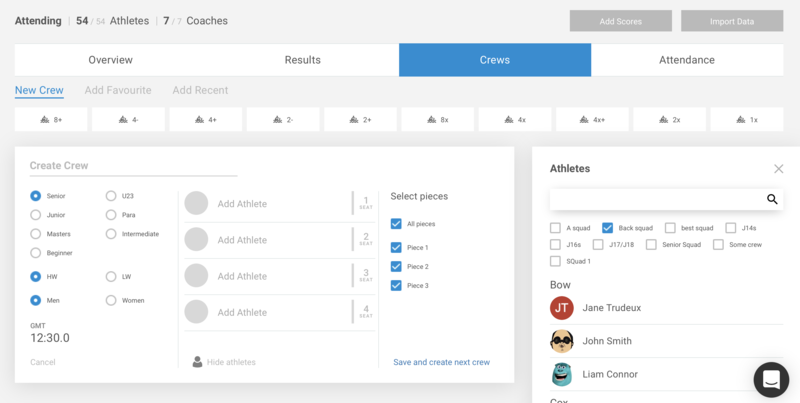 Creating crews in Rowers allows you to send out crew lists to athletes before sessions but also to stay up to date if athletes change their plans which they do. For Rowing and Canoe / Kayak sessions we allow you to create boats. For Rowing sessions we show all the rowing boat types. For canoeing & kayaking we show all the relevant boat types. When you go to the crews page on a session for the first time you will be shown the screen below. You will see a list of boat types clicking on this will add the boat type to the blank area. Once you’ve selected a boat type you will be asked to name the crew and choose the boat type. Selecting a boat type allows you to use the GMT feature, this will give you % GMTs for water results and show you crew GMTs for their GPS data. If you session has pieces you can choose which piece you want that crew to be added to. 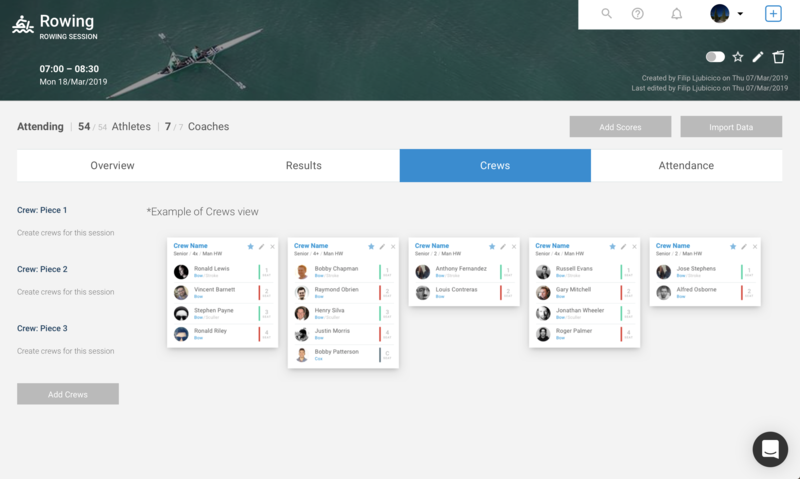 You can select your favourite crews by selecting the tab Add Favourite, this will open a list of crews that have been set as favourites. Directly to the right of the boat is a list of athletes that are involved in the session. They will appear in different colours based on their settings. There are two ways to add athletes to crews. You can drag and drop athletes into the seat or you can type the athletes name into the seat. Once you have added a boat into the Crew Area, you can start dragging and dropping athletes from the Athlete Area into seats in the boat. Once you’ve started adding athletes they will become transparent in the Athlete Area so you know they have been added. Once you have added a boat into the Crew Area, you can start typing the athletes name into the seat and you’ll be able to select the athlete you want. Once you’ve started adding athletes they will become transparent in the Athlete Area so you know they have been added. When you are finished you can notify your athletes by pressing the Notify Crew button in the top right. This will send an email and notification to the athletes that crews have been made. Favourite crews allows you to quickly add boats to the Crew Area. The favourite is based upon the settings you made when creating the favourite. To create a favourite crew click on the star which is next to the crew. Select this and the favourite will be made.